Normally I wouldn't impose on visiting guests to cook for me in my kitchen. I'd make them sit down for a dinner I cooked or probably make Vijay come up with one of his signatures. The worst that could happen is the well-fed friends find themselves doing the dishes, which, in my puny kitchen can be of some challenge but afterwards be rewarded with at least a dessert and some good coffee. However, when Vijay's brother and a few friends drove down for The Cranberries last weekend, I took the chance to pounce on Hon Sing to make me this lamb. Ever since I've seen his handiwork last Christmas, all I can think of whenever his name came up is roasted leg of lamb, roasted leg of lamb, roasted leg of lamb - you get the idea. Not wanting to miss out on the fun, Hon Sing's fiancée Rita decided to provide the mashed potato side and Vijay excited to whip up the appetizer with his now infamous Balthazar mushroom soup. So I got to take the day off from my kitchen while the three of them took the reigns in it, making use of every free flat surface available to make Sunday dinner. Some 'sowing' of garlic cloves and rosemary leaves took place while I relaxed in front of the tele with a piece of carrot cake and some ginger tea. Before long, wafts of hunger-inducing aroma of an incredible roast began to float around our flat, sending me flying off the couch to the kitchen cabinets and the dinner table, setting it up for the much anticipated centerpiece. Vijay and I knew that our earlier morning trip marketing trip to Tekka was well worth it as the oven sizzled with impending goodness of the quality meat I secured after a good 15 minutes queue at one of the most trusted butchers in the vicinity (Mr. Johari even patiently lectured me on why there's no brisket equivalent in lamb, sheep and goat as I feebly attempted to see if I could get a cut of lamb suitable to make this). As Hon Sing basted the leg an hour into roasting, the rest of us hasten the cooking and table setting, not willing to wait much longer to eat as soon as the lamb is done and rested. As Jamie put it, a fresh produce should be treated simply and be allowed to speak for itself with its own flavor. Instead of rattling off a long list of ingredients like I expected, Hon Sing asked for just garlic and rosemary for the lamb - no busy spices or complicated marinate for this one. While the rest of the table was quite taken with the meat, I was more impressed with the mint caper sauce. Normally you'd expect your pieces of juicy cuts be served with mint jelly or mint sauce. The combination of brined capers and chopped fresh mint was unexpected but just divine, providing a refreshing lift to the common deglazed pan dripping gravy. I've only cooked a leg of lamb once - the tangy brisket way - but I can safely say I'll only roast it this way from now on. Normally I wouldn't impose on you to try out what I post here, but this is one of those rare occasions I would. 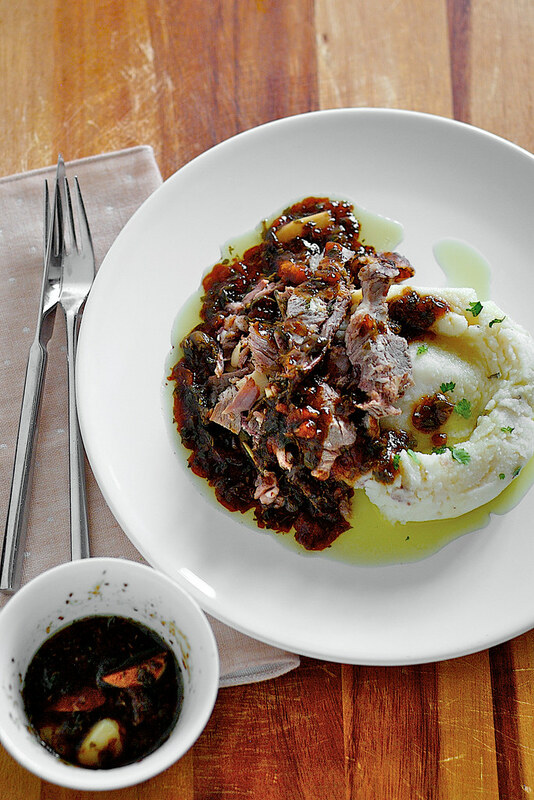 Go get that lamb leg or shoulder and start 'sowing'. You'll thank me for it. Adapted barely from Jamie Oliver's Incredible Roasted Shoulder of Lamb with Smashed Veg and Greens from his book Jamie at Home. To roast the lamb: Preheat your oven to full whack, mine goes up to 240°C max. With a sharp knife, slash the fat side of the lamb all over, making incisions about 1-inch deep. 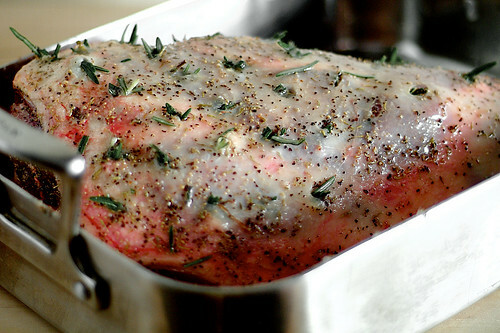 Lay half the sprigs of rosemary and half the garlic cloves on the bottom of a heavy-bottomed, high-sided roasting tray. Remove the leaves from 2-3 sprigs of rosemary. Massage the lamb all over with olive oil, season with salt and pepper. Push some rosemary leaves and garlic cloves into the incisions made earlier. Place the prepared lamb in the tray on top of the rosemary and garlic, and put the rest of the rosemary and garlic on top of the lamb. Spread the goose fat evenly over the lamb, if using. Place the tray into the oven and allow to brown on high heat for 10 minutes. Turn the oven down to 180°C and cook for 1 1/2 to 2 hours, basting in between with pan drippings, till it’s done - for me this is between rare to medium rare, internal temperature 60-65°C. My convection oven with fan on took about 1 1/2 hours. 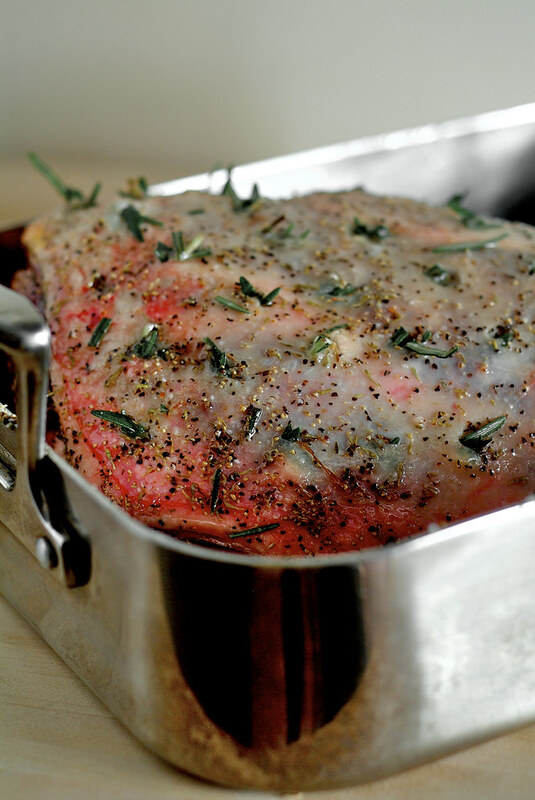 Remove from the oven and transfer the lamb onto a baking tray topped with a wire rack. Tent loosely with foil and allow to rest for at least 30 minutes before carving. Retain the release juices from both the baking tray and roasting pan for the gravy. 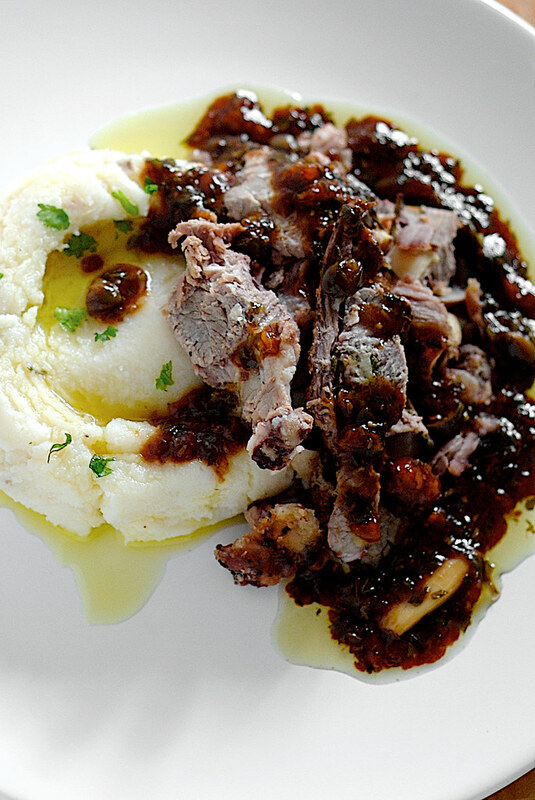 Carve the lamb and serve with the gravy and mashed potatoes or smashed vegetables on the side. To make the sauce: Skim away excess fat (if any) from the roasting tray, discard the rosemary stalks. Put the tray on the hob over high heat and make a roux by mixing in the flour. Stir vigorously and deglaze immediately with the stock, stirring and scraping off all the sticky goodness from the bottom and sides of the tray. Add the capers and juices released from the resting meat, turn the heat down and simmer for a few minutes. Once the sauce has reduced slightly, add the mint and vinegar, mix briefly and transfer into a jug/gravy boat. i swear, when this heat wave has lessened its hold around my neck, i will make this. my love & i adore lamb, but above all else, i enjoy a good sauce, to dip into or drizzle over something. Lan: I got you. Here it doesn't make a difference, it's hot all year round, we make roasts while we ourselves roast and sweat in the kitchen. I hit the shower after cooking, else nothing will taste good. 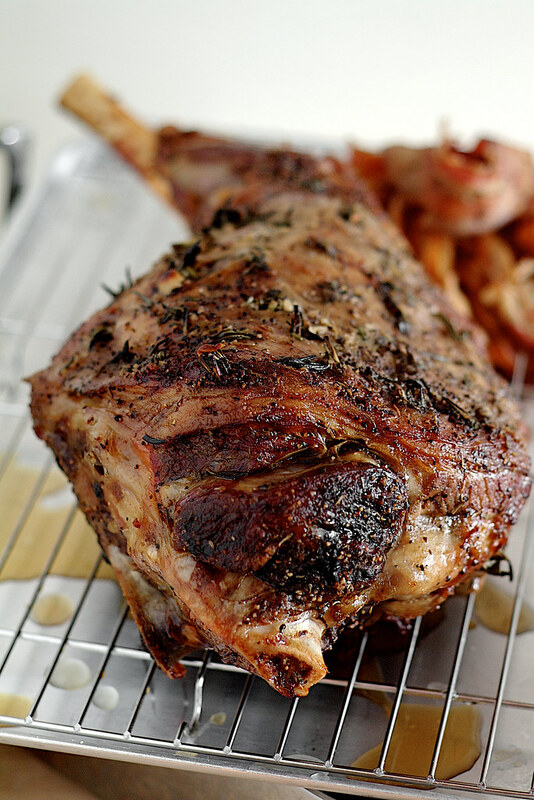 I have never cooked a leg of lamb before and I'm dying to do so! I'm got so excited the moment I saw this and I'm trying to see when I can make it! I have read about Mr. Johari on the papers once and I will go to him for this leg of lamb too despite the journey. Lovely meal!!! Pei Lin: I was really surprised at how tasty this came out. Yes, fresh lamb is a must from a good butcher. Normally I'd order online from another butcher from Holland Village but Joe's is cheaper and we had to go there that day anyway. I will so heed your advice and roast that lamb this weekend. I am sold. Will take lots of pics. Kelly: Thanks, hope you find my banters interesting. Reese: Remember to post them up, am sure your family will love this. Swee San: Hope you weren't too hungry when you looked at this.